Today’s Finalist is Monica Corwin with her Paranormal Romance, Midnight’s Balance. Instead of stopping, as I expected, she delved her fingers through the invisible shield and ripped it open, like split mesh on a screen door. She raised one perfectly plucked eyebrow and met my probably quizzical gaze. It had been far too long since someone was brave enough to look me in the eye, let along go full on Tombstone. She shuffled into the entry way and reached back for her suitcase, it banging against her knees before she set it down on the hardwood floor. A shiver went through her, but I knew her family too well to think she was affected by the cold. So many of her generation lived in my house, she was feeling all of their magic in my wards. I glanced around my work space before depositing her phone on the top of a chair. Books piled high from one corner to the other, not to mention the ones on the shelves lining an entire wall floor to ceiling. A lab table was set up in the middle of the room, plants with heat lamps hanging from the ceiling above it. “I didn’t expect you to have a computer,” she said, from behind a maroon tufted high-back chair. She picked up the MacBook and shook it in the air. “Computer, you have a laptop…I didn’t expect you to have one. I glanced up at her from over the table top. Not in 200 years had anyone offered to make tea for me. “Please, the kettle is on the back burner.” I pointed toward the hallway to the kitchen. She spun and left and I watched her go. A pretty little thing, like all the women in her family. But, training a new familiar was tough work. Especially in the midst of magical turmoil. I glanced at the radio, now silent, but before Marina’s arrival it had been blaring magical hate speech for an hour. I didn’t particularly enjoy listening to things like that, but know your enemy, as they say. Times were changing. It was getting more difficult to hide anything from anyone. And with big brother hanging over everyone’s shoulder it was even worse. A witch burned at the stake only a month ago after she used magic to save a bus load of people from an armed gunman. Her reward: turned to ash. The guilt threatened to choke me. I let out a long sigh and shuffled some books stacked on the side of my table. I hadn’t been in my home realm at the time of the burning, or I could have saved her. I stacked the books in front of me, spine to spine like the vertebrates on a human. I accepted the hot ceramic carefully cradling it in my palms, the heat sinking into my stiff and sore fingertips. Old age has its pitfalls even if I didn’t look a day over 40. “You look tired,” she said, pulling the stack of books toward her. She lined the stack back up as I had it and shifted it back toward me. I sipped the tea and waited to see if she was one of those people who could tolerate silence. When I offered nothing else she turned and wandered to the bookcase caressing some of the titles gently. I glanced at my watch. We made it a whole eight minutes without speaking. Not bad for the first day. I decided to remain silent on that one. She shrugged and continued down the line of books stopping to read each carefully. A vibration sounded through the room and I shook myself. My phone was vibrating in my pocket. I slipped it out and glanced at the screen. A twitter alert had popped up. She glanced up, caught my expression, and folded her lips under trying to hide the smile. “Challenge accepted, Old Man.” Her thumbs took up a furious pace on the iPhone larger than her head. I sat back leaning the weight on the stool into my feet hooked into the wrung below. Her blonde hair shone orange from one side from the firelight at the end of the room. I took a sip of my tea and closed my eyes letting her aura filter in. It was like trying to reach out and grab a black hole. Whatever her power it was stronger than any woman in her family yet, and null, completely devoid of magic, like magic turned inside out. She shrugged and turned back to the books. Lucky you! 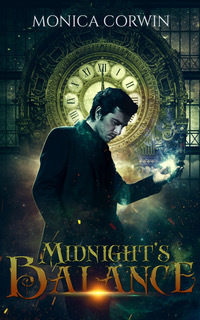 Midnight’s Balance is up for preorder HERE! On the web at: http://www.monicacorwin.com. Instagram: http://www.instagram.com/rosetyper9. Nice going, Monica. Wondering where the romance is gonna come from but I like the Merlin vibe I’m getting from our hero. Very Doomsday-meets-Sword-in-the-Stone. Aw thanks. It’s more UF than romance but there are def some romance elements. It stared life as a PNR though. My vision of him is like Merlin meets John Wick. This one was one of my favorites from the beginning! I’ll be adding it to my TBR pile for sure. The cover is gorgeous, too! I’ve enjoyed this entry from the beginning! I couldn’t resist and have pre-ordered it.